Here we read about some basic electrical terms and definition which are use in our daily routine.I think it will help for your better understanding these general terms.In this article we will know about the basic electrical terms. Work done in carrying a unit positive charge from infinity to that point is called as a voltage at that point. Rate of flow of electrons is termed as a current. Easy to step up and step down using Transformer Difficult to step up or down as transformer cannot be used. A.C. machines are cheaper and more reliable then D.C. Machines DC Machines are costlier and less reliable compared to AC Machines. Normally 3 wires for transmission and 4 wires for distribution required. Only one or two conductors are required. In case of one wire, earth is used for return path. The number of cycles per second is called the frequency of the alternating quantity. Its unit is Hertz (Hz). In India and U.K. supply frequency is 50 Hz, where as in Japan and Saudi Arabia it is 60 Hz. 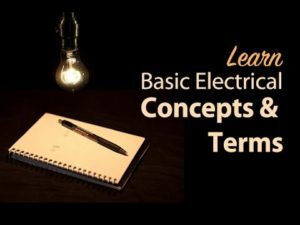 Hence these are some Basic electrical term which is use in electrical circuit better understand or to know about electrical you must need to know about these basic electrical terms. if you will find any incorrect in above article you comment below in comment box.